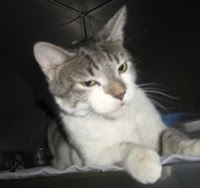 Chris is a curious, peppy 4 year old Tiger who was hanging outside of an apartment building in NE DC. One of the residents was afraid he would freeze so she gave us a call. Chris is a friendly little guy who likes to explore new environments with the attention of a detective. Tolerant and gentle, this fabulous feline may be on the older side, but he's still got lots of adolescent cat in him and still enjoys playtime. Come down and meet this sweet little guy today!